TORONTO, May 20, 2014 (GLOBE NEWSWIRE) -- Carlisle Goldfields Limited ("Carlisle" or the "Company") (TSX:CGJ) is pleased to announce that Tetra Tech has invited Carlisle to present its Lynn Lake Gold Camp project at the Tetra Tech Mining Investment Conference in London, England. The mining event takes place on May 20, 2014 at the 'Gherkin' Tower in London's financial district. Each of the top six projects will present to an audience of accredited investors. Carlisle President and CEO Abraham Drost stated that "we are delighted to be recognized by Tetra Tech as being a best in class project and welcome the opportunity to speak on the deep value proposition in Carlisle which has been realized by the enlightened work of the Tetra Tech team." About Carlisle: Carlisle Goldfields Limited is a Canadian‐based gold exploration and development company focused on development of its Lynn Lake Gold Camp in Lynn Lake, Manitoba, Canada. Carlisle has NI 43-101 compliant mineral resource estimates on five (5) deposits within its Lynn Lake Gold Camp, four of which form the basis for the December, 2013 PEA (Farley Lake Mine Deposit, MacLellan Mine Deposit, Burnt Timber Mine Deposit, and Linkwood Deposit). The results of an optimized Preliminary Economic Assessment (PEA) disseminated on February 27, 2014 focuses on an open pit mine model for the historical Farley Lake Mine and MacLellan Mine gold deposits only, with a total of approximately 1.5 million ounces Measured and Indicated and 200,000 ounces gold Inferred. 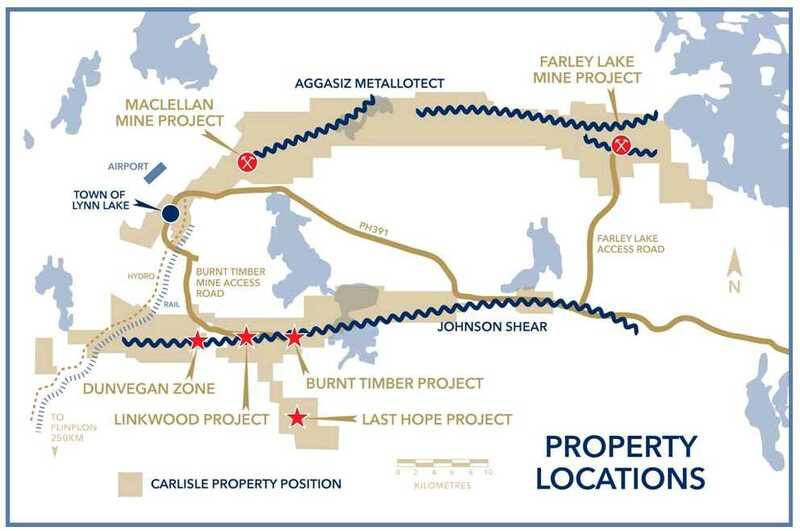 Carlisle's objective, together with its government and First Nation project partners, is to efficiently advance this optimized project through bankable feasibility study, environmental and mine permitting to set the stage for resumption of gold production in the historical Lynn Lake mining camp, Manitoba. Further details including mineral resource technical reports are available on SEDAR (www.sedar.com) or carlislegold.com/resource-summary.php. Except for statements of historical fact contained herein, the information in this press release may constitute "forward-looking information" within the meaning of Canadian securities law. Other than statements of historical fact, all statements are "forward-looking statements", including the establishment and estimate of resources that involve various known and unknown risks and uncertainties and other factors. There can be no assurance that such statements will prove accurate. Results and future events could differ materially from those anticipated in such statements. Readers of this press release are cautioned not to place undue reliance on these "forward-looking statements". Except as otherwise required by applicable securities statutes or regulation, Carlisle expressly disclaims any intent or obligation to update publicly forward-looking information, whether as a result of new information, future events or otherwise. Neither IIROC nor the TSX accepts responsibility for the adequacy or accuracy of this press release.